Find hotel near Double Decker Living Root .. In order to appreciate the beauty of Living Root Bridge, you need to understand the dynamics of their formation. The Living Root Bridges are century-old natural shoots of the banyan fig trees grown around the vicinity of large and small rivers which in turn aid in providing a means to cross the bridges by entangling those shoots from opposite banks. As the shoots gain strength with time, the bridges become more and more robust. The phenomenon is unique and is a prominent feature of Meghalaya region. Every year tourists from around the world come to see these bridges. The village of Nongriat is the focal point of the famous Double Decker Living Root Bridge. According to the local tales, there are two layers of bridges on the river here and the lower living Root Bridge got submerged in a heavy deluge around 40 years back. As a result, a higher elevated living root bridge above this one was conceived to tide over this problem. 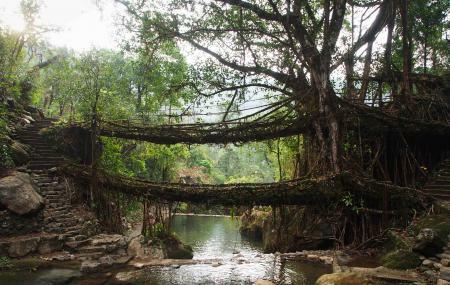 Scientifically the living Root bridges are more sturdy compared to the steel wire ones and provide a firm footing on the base for easy movement all along. There is a small natural swimming place around this bridge. There is also a small guest house on the other side of the bridge run by Meghalaya Government that promotes tourism here. Walking distance from Cherrapunjee city. How popular is Double Decker Living Root Bridge? People normally club together Ka Khoh Ramhah and Dawki Boat Services while planning their visit to Double Decker Living Root Bridge.